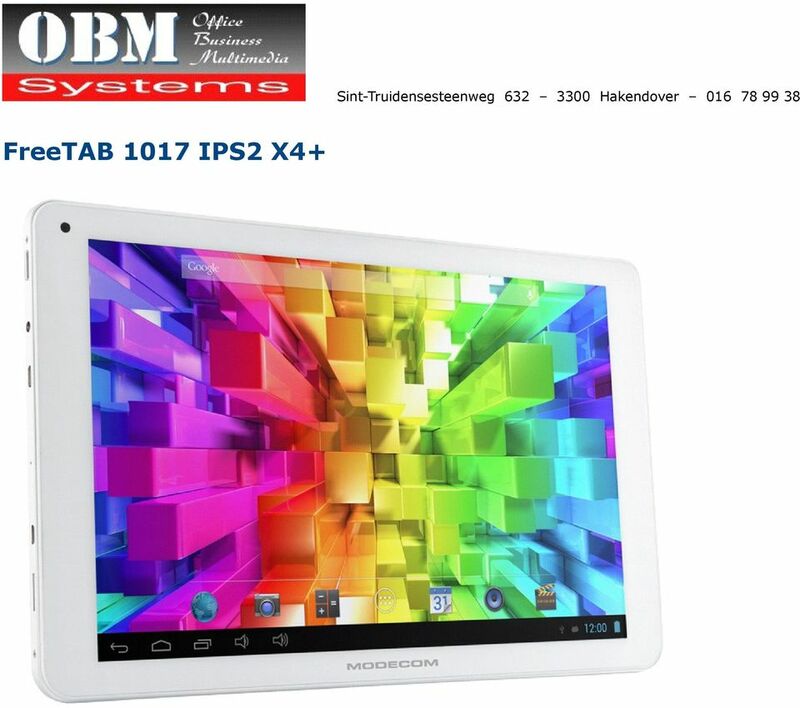 Download "FreeTAB 1017 IPS2 X4+ Sint-Truidensesteenweg 632 3300 Hakendover 016 78 99 38"
2 MODECOM FreeTAB 1017 IPS2 X4 is a premium tablet PC of outstanding technical parameters, efficiency and design. This high-end device is equipped with incredibly fast and powerful Quad-core processor and Quad-core graphic system. 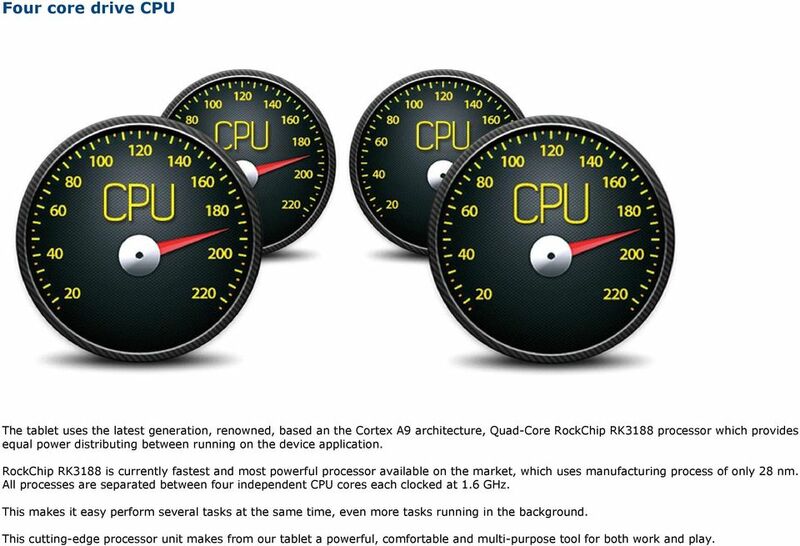 In practice, this CPU enables ultra-smooth, flawless performance of all apps. It is a perfect tool suitable for both business and entertainment. With the New Generation 10,1 IPS2 display with unsurpassed WUXGA resolution of 1920 x 1200 pixels and 2GB of DDR3 RAM memory it meets no match in the market. Fast graphics system MALI-400 MP (4-core GPU) Efficient RAM memory of DDR3 type Graphic processor MALI-400 MP (4 x 533 MHz) enables user to play games with 3D graphics as well as to use advanced applications. The MALI-400 MP GPU also supports the most advanced, popular graphics standard OpenGL ES 1.1/2/0 and OpenVG 1.1. Built-in 2GB of RAM DDR3 type provides fast communication between internal devices which guarantees optimized managmenet of running applications. Highcapacity and high-speed 16GB flash disk Micro SD card reader capable of supporting cards SDHC up to 32GB Built-in 16GB flash disk provides storage for large amounts of data, photos, videos and various kinds of application. 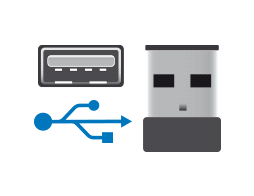 Internal storage can be enlarged easily by using built-in microsd card reader with support up to 32GB micro SDHC. This means a maximum total of 40GB. 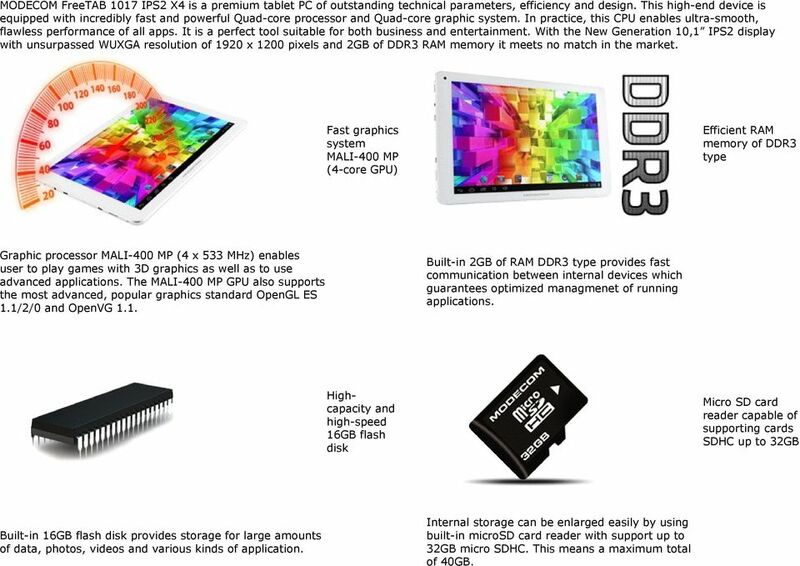 3 Four core drive CPU The tablet uses the latest generation, renowned, based an the Cortex A9 architecture, Quad-Core RockChip RK3188 processor which provides equal power distributing between running on the device application. RockChip RK3188 is currently fastest and most powerful processor available on the market, which uses manufacturing process of only 28 nm. All processes are separated between four independent CPU cores each clocked at 1.6 GHz. This makes it easy perform several tasks at the same time, even more tasks running in the background. This cutting-edge processor unit makes from our tablet a powerful, comfortable and multi-purpose tool for both work and play. 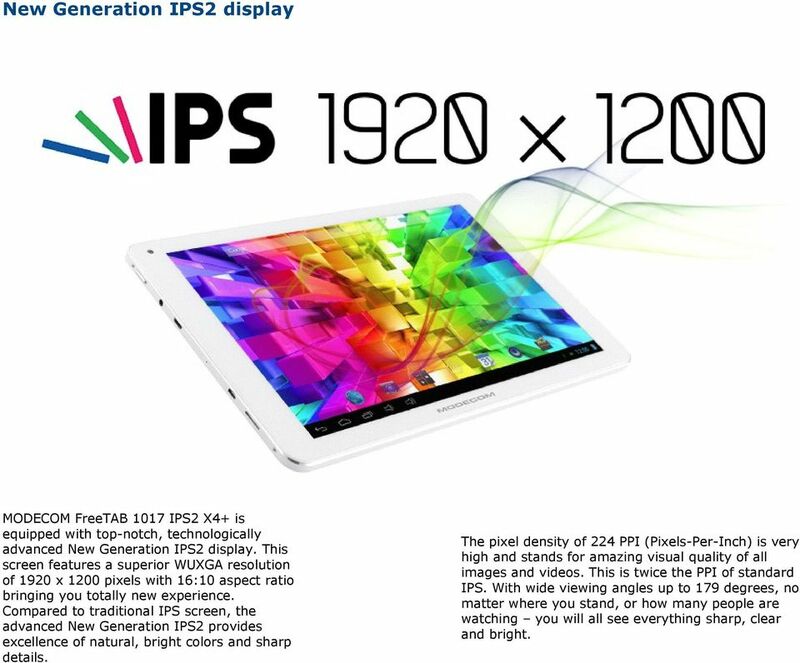 4 New Generation IPS2 display MODECOM FreeTAB 1017 IPS2 X4+ is equipped with top-notch, technologically advanced New Generation IPS2 display. This screen features a superior WUXGA resolution of 1920 x 1200 pixels with 16:10 aspect ratio bringing you totally new experience. Compared to traditional IPS screen, the advanced New Generation IPS2 provides excellence of natural, bright colors and sharp details. The pixel density of 224 PPI (Pixels-Per-Inch) is very high and stands for amazing visual quality of all images and videos. This is twice the PPI of standard IPS. With wide viewing angles up to 179 degrees, no matter where you stand, or how many people are watching you will all see everything sharp, clear and bright. 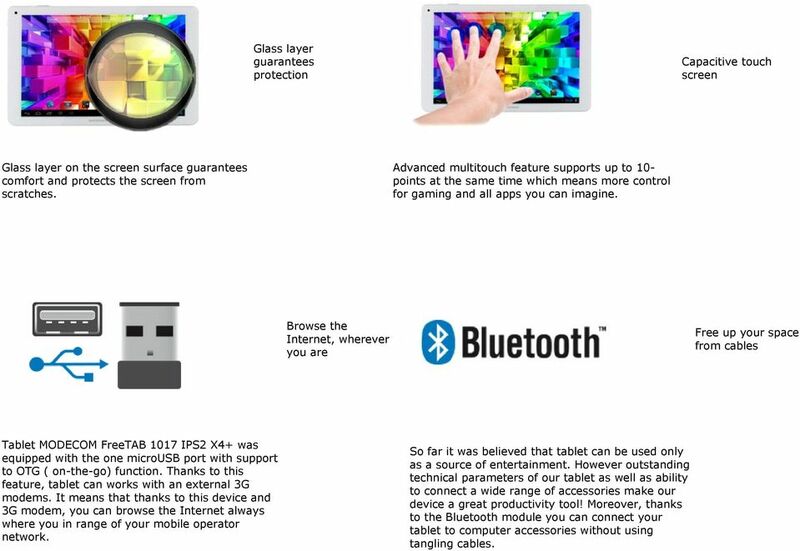 5 Glass layer guarantees protection Capacitive touch screen Glass layer on the screen surface guarantees comfort and protects the screen from scratches. Advanced multitouch feature supports up to 10- points at the same time which means more control for gaming and all apps you can imagine. Browse the Internet, wherever you are Free up your space from cables Tablet MODECOM FreeTAB 1017 IPS2 X4+ was equipped with the one microusb port with support to OTG ( on-the-go) function. Thanks to this feature, tablet can works with an external 3G modems. It means that thanks to this device and 3G modem, you can browse the Internet always where you in range of your mobile operator network. So far it was believed that tablet can be used only as a source of entertainment. 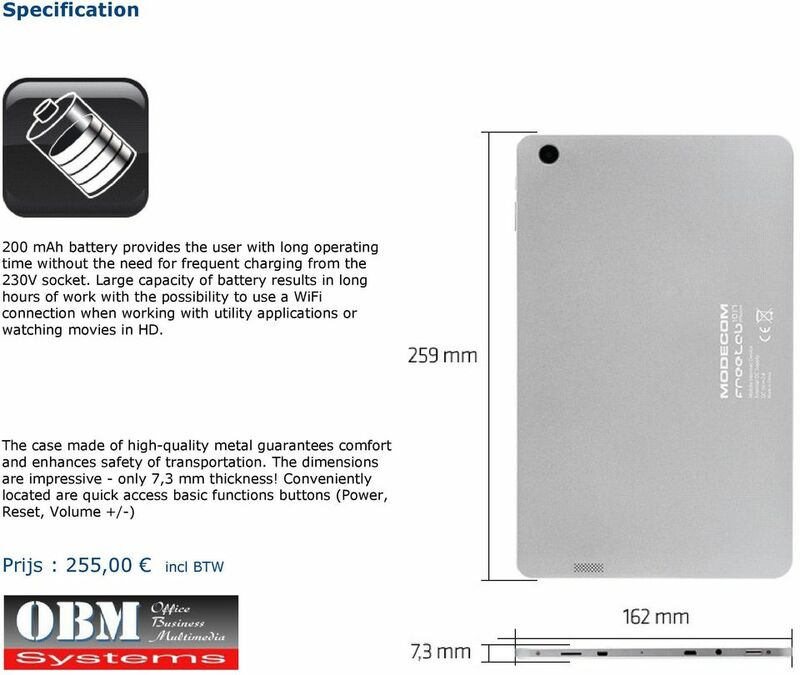 However outstanding technical parameters of our tablet as well as ability to connect a wide range of accessories make our device a great productivity tool! 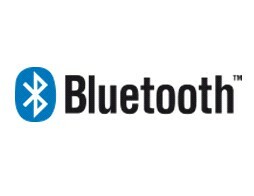 Moreover, thanks to the Bluetooth module you can connect your tablet to computer accessories without using tangling cables. 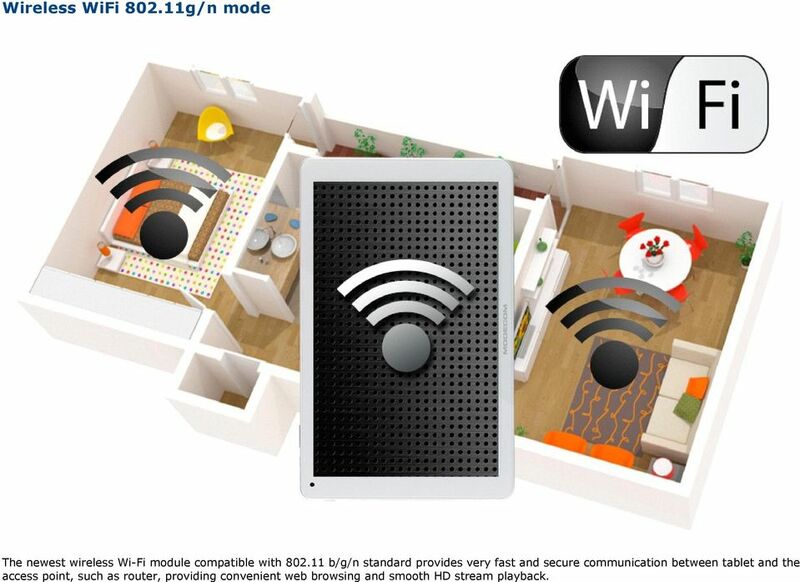 6 Wireless WiFi g/n mode The newest wireless Wi-Fi module compatible with b/g/n standard provides very fast and secure communication between tablet and the access point, such as router, providing convenient web browsing and smooth HD stream playback. 7 High quality HDMI 1.4 connector Advanced HDMI 1.4 guarantees high quality images sent from the tablet to TV with HDMI cable. 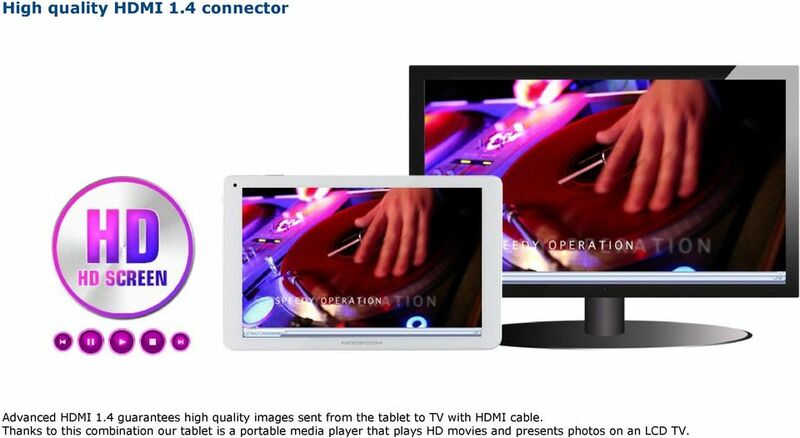 Thanks to this combination our tablet is a portable media player that plays HD movies and presents photos on an LCD TV. 8 Two top-quality cameras Tablet is equipped with two top-quality cameras with 2.0 Mpix (front) and 5.0 Mpix (rear) resolution. Whereas camera placed at the back lets you take pictures and record video in high quality. 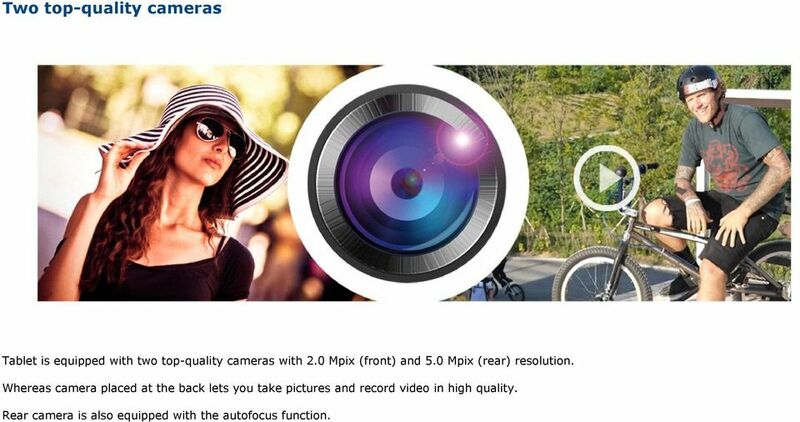 Rear camera is also equipped with the autofocus function. 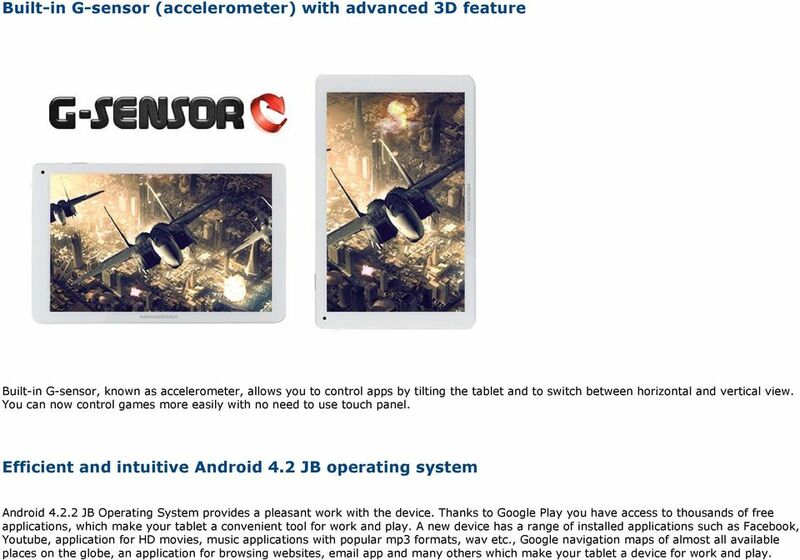 9 Built-in G-sensor (accelerometer) with advanced 3D feature Built-in G-sensor, known as accelerometer, allows you to control apps by tilting the tablet and to switch between horizontal and vertical view. You can now control games more easily with no need to use touch panel. Efficient and intuitive Android 4.2 JB operating system Android JB Operating System provides a pleasant work with the device. Thanks to Google Play you have access to thousands of free applications, which make your tablet a convenient tool for work and play. A new device has a range of installed applications such as Facebook, Youtube, application for HD movies, music applications with popular mp3 formats, wav etc., Google navigation maps of almost all available places on the globe, an application for browsing websites, app and many others which make your tablet a device for work and play. 22 (21.5 viewable) Smart Display, Full HD, Rockchip Quad-Core, Optical touch, Android KitKat. VSD224 The ViewSonic VSD224 is a 22 (21.5 viewable) all-in-one Smart Display with 1920x1080 Full HD resolution. Owner s Manual. X10.com, a Division of X10 Wireless Technology, Inc. 400 Forge Way, Suite 409-412, Rockaway, NJ 07866 CM002-9/11. Industry First X86-based Single Board Computer JaguarBoard Released HongKong, China (May 12th, 2015) Jaguar Electronic HK Co., Ltd officially launched the first X86-based single board computer called JaguarBoard. Hardware models As supported by BCF, Faculty of Mathematics & Computer Science Last revision: October 2013 Common Laptop HP EliteBook 8570W Total price: EUR 1129.31 incl. VAT Base price: EUR 815.63 excl. www.getinvirtual.com WHY WE ARE DIFFERENT? Virtual è una famiglia di prodotti unici. Una tecnologia declinata dallo smartophone allo smartwatch. Una collezione studiata da un gruppo di designer ed ingegneri.